Structural Biology Research Center | Division of Biological Science, Graduate School of Science, Nagoya University. 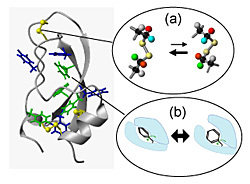 In our research center, by employing various analytical methods in combination (X-ray protein crystallography, electron cryo-microscopy, and protein NMR, among others), we are addressing scientific questions aimed at improving our understanding of the structural dynamics of protein molecules, the structural elucidation of large protein complexes, and the dynamics of protein assembly in the cell. Through these works, we would like to account for the mechanisms of protein function in terms of chemistry and physics, based on protein structure at atomic resolution. Any biological scientists at Nagoya access the leading-edge analytical methods that we have acquired and developed, as well as the large facilities we operate. Because we have obtained atomic-resolution structures by employing X-ray protein crystallography, we tend to view proteins as solid immobile structures. However, in order to understand how proteins work, we need to know how protein structure fluctuates and changes. In the SAIL-NMR methods, developed by Kainosho, minimal numbers of atoms are isotope-labeled, which reduce dramatically the number of NMR peaks, thereby improving the S/N ratio. This enables us then to measure precisely the isomerization of disulfide bonds (Fig. 2a); the rate of rotation of aromatic rings of Tyr or Phe at the 100-1000 msec scale (Fig. 1; Fig. 2b); and other parameters. This rotation is accounted for by the breathing movement of the entire protein molecules, and is sensitive to interactions with other proteins and ligands. We are now able to follow the paths of proton within a protein molecule. This new NMR techniques is now opening up a new field of study, “protein structural dynamics”, and thereby extending our understanding of nature. Part of the 2D NMR spectrum obtained from a protein that was uniformly isotope-labeled (left) and from a SAIL-protein (right). In the uniformly labeled protein, all the carbon atoms are isotope-labeled, whereas in the SAIL-protein, only Cd’s are labeled. NMR peaks from the SAIL-protein are much sharper and more easily assignable. Illustrating fluctuations of side chains of a protein molecule. (a) The isomerization of a disulfide bond. (b) The rotation of the aromatic ring. Torizawa et al. (2005) J. Am. Chem. Soc. 127: 12620-6. Kainosho et al. (2006) Nature 440:52-57. Ikeya et al. (2006) Magn. Reson. Chem. 44: S152-157. Takeda et al. (2007) Nat. Protoc. 2: 2896-902. Takeda et al. (2008) J. Mol. Biol. 380: 608-22. Takeda et al. (2008) FEBS J. 275: 5873-5884. 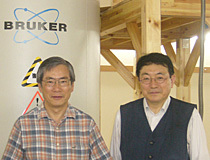 Yoshida et al. (2008) J. Mol. Biol. 384: 690-701. Ikeya et al. (2009) J. Biomol. NMR. 44:261-72. Takeda et al. (2009) J. Am. Chem. Soc. 131: 18556-18562. Takeda et al (2010) J. Biomol. NMR 46: 45-9.